1. Heat the oil in a large heavy-based frying pan and cook the bacon over a medium-high heat until crisp – about 4-6 minutes; set aside in a large bowl. Add the salad onion and chilli to the pan, fry for 2 minutes, then tip into the bowl with the bacon. 2. Add the butter and spinach (or other greens) to the pan and cook for a few minutes, until wilted (you may need to do this in batches). Season and cool. 3. Grease a baking dish or casserole (about 2 litres in volume) with softened butter. Tip in the spinach (or greens) and the bacon mixture, bread, cheddar and herbs. Whisk the eggs, milk and cream in a jug, season and pour into the baking dish. Let it sit for at least 30 minutes, but ideally chill overnight for up to 12 hours. 4. Preheat the oven to 160°C, gas mark 3. 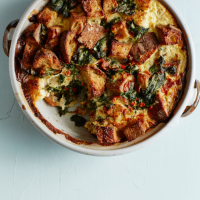 Bake the strata for 35-40 minutes, or until just set with a very slight wobble in the centre. Rest for 5 minutes before serving. This recipe was first published in Thu Apr 26 16:40:08 BST 2018.